Are you looking for the Best Laptop for Powerpoint Presentations? Well, guess what? You’ve landed on the right page. I’ll show you the Top 5 Best Laptop for Powerpoint, which will be very easy to use and affordable as well. As we all know, if you’re working a corporate job or a management student, then making presentations is routine work, and the ability to get each presentation done quickly is of the essence. And for that, having a portable computer that can speed up the process is very important. Almost all laptops available in the market come with a 16:9 aspect ratio screen, whereas most presentations are created in 4:3 aspect ratio format. Hence keeping this thing is mind; I’ve suggested laptops that offer mostly 16:10 or 3:2 aspect ratio, which makes it easy to create a powerpoint presentation and ideal for the business environment too. Below is the detailed description of the Top 5 Best Laptop for Powerpoint Presentations. Just recently Apple updated their MacBook Air series, which is a revolutionary product for the Apple brand. Apple surprised the world with its MacBook Air series, which weighed less than 3lbs (13.3” model) while offering excellent performance when it was initially launched. It started the whole Ultrabook rage that prompted other laptop manufacturers to build laptops that sort of imitated the MacBook Air. Now with the 2nd generation MacBook Air, you get better overall performance compared to the previous model and a better design as well. For starters, the latest Apple MacBook Air comes with a 13.3” screen that has an aspect ratio of 16:10 and offers a massive screen resolution of 2560×1600 with LED-backlit and IPS technology. It is a retina display that offers Pixel Density of 227 PPI along with integrated Touch ID sensor for unlocking the laptop with your fingerprint. The laptop comes with Apple’s own softwares like Pages, Numbers, and Keynote; similar to Word, Excel, and Powerpoint. However, Microsoft has their Mac OS edition of Windows Office; hence you don’t have to tamper with newer presentation software if you switch from Windows to Mac OS. However, on the downside, the internals of MacBook Air isn’t as powerful compared to laptops in a similar price range, yet if your requirement is basically creating powerpoint presentations, then this laptop won’t disappoint at all. On the other hand, the laptop comes with 2x Thunderbolt 3 ports that can offer multiple services like charging the laptop, charging external devices, connecting to external displays, data transfer and so on. You’ll be shocked to know that the latest MacBook Air is capable of supporting 1x 5K display or 2x 4K display at the same time. Additionally, it comes with Intel HD 617 graphics; along with that, you can also connect this laptop to an eGPU when you require dominant performance. Moreover, the laptop weighs only 2.75lbs and offers a battery life of around 12 hours on full charge via its 50Whr battery. Additional features include: Bluetooth 4.2, Dual Band Wifi, Stereo Speakers, 3 microphones, 3.5mm jack, LED keyboard, 720p Facetime camera, and 30W USB-C Charger. 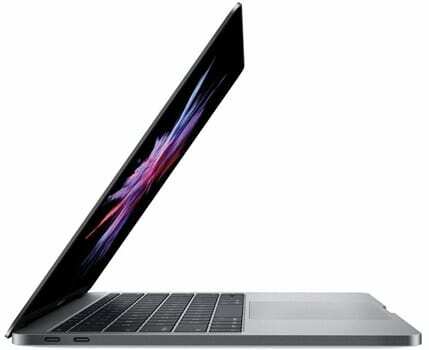 Unlike the MacBook Air that comes with 1.6 GHz Dual-Core Intel i5-8210Y processor, the MacBook Pro 13” comes with 2.3GHz Quad-Core Intel i5-8259U processor that is twice as powerful processor compared to one in the latest MacBook Air. To ease your presentation woes; the laptop comes with 13.3” screen with IPS display that offers resolution of 2560×1600 along with pixel density of 227 PPI. Not only that, the beautiful laptop screen is coupled with the brightest display of 500 nits, which is hard to find even in laptops twice the price of MacBook Pro. However, what makes the MacBook Pro the best laptop for powerpoint presentations is the extra large touchpad that Apple provides with this laptop. The big touchpad makes it easy to drag and drop elements in your Powerpoint presentation or move elements the way you want without running out of touchpad area. To be honest, Apple provides the most massive touchpad you’ll ever see on 13” or 15” laptop in the MacBook Pro. Other than that, it also comes with Touch Bar, which is a horizontal touch screen that offers additional functions and toggles depending on the software above the keyboard. The laptop comes with 4x USB-C Thunderbolt 3 ports (2 on each side) along with a 3.5mm jack. With this, you’ll be able to connect 2x 5K displays or 4x 4K displays with the laptop. Along with a powerful processor, you also get better Intel Iris Plus 655 graphics that offers better graphical performance compared to the one in MacBook Pro. Weighing at 3.02 lbs, the 13” MacBook Pro is lighter than most high-end laptops available in the market, yet offers excellent performance. The 13.3” version of MacBook Pro comes with 58Whr of battery that is capable of powering the laptop for up to 10 hours along with 61W USB Type-C charger. After the success of Microsoft Surface and its multiple iterations, Microsoft is on a roll as it has launched multiple variations based on the Microsoft Surface tablet. 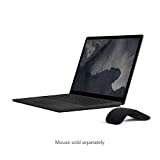 One of them is Microsoft Surface Laptop 2, which is the latest and 2nd generation series of the Microsoft Surface Laptop. Just like the previously mentioned laptops, the Microsoft Surface Laptop 2 comes with a 13” display (13.5” to be precise) and weighs under the 3lbs mark. However, it features a 3:2 aspect ratio display that has a resolution of 2256 x 1504, which is obviously higher and better than most laptops in the market that come with Full HD displays. The 3:2 aspect ratio screen; will quickly help you in making presentations and viewing them on the go without large black bars on the left and right side. The 3:2 aspect ratio also makes it easier to view documents, excel sheets and viewing web pages online due to longer screen size, which in turn will reduce scrolling down a lot. The Microsoft Surface Laptop 2 is available in multiple color options like Black, Burgundy, Cobalt, and Platinum. However, in an office environment; either the Black or Platinum will be a proper fit. Other than that, there are multiple options available in the hardware configuration too. You get to choose between the latest 8th generation Intel Core i5 and Core i7 processors, which are power efficient processors that draw low power from the battery. On the storage front, you can choose between RAM size of 8GB and 16GB, whereas you get 128GB, 256GB, 512GB and 1TB SSD storage options. Considering the battery life, Microsoft claims that the Laptop 2 can last for around 14 hours on full charge; however, real-life battery life test shows that on a full charge the laptop can last for about 6-7 hours. Additionally, with excellent engineering, Microsoft has removed the fan from the Laptop 2, even the keyboard keys are extremely quiet. Hence, you’ll have a quieter powerpoint presentation making sessions, without your colleagues noticing you. The only downside is that the Microsoft Surface Laptop 2 comes with only a single USB 3.1 port along with mini-display port and 3.5mm jack. All the laptops mentioned above are mainly meant for business use and ideal for creating presentations. However, if your requirement is of a laptop that can offer you no-nonsense performance in office, while still have enough power for mild gaming once your reach home; then my suggestion is the Huawei Matebook X Pro. A lot of you may think that Huawei is a smartphone brand and isn’t known at all for laptops; however, if you check its reviews all over the internet, then you’ll realize that Huawei has hit the ball out of the ground with the Matebook X Pro. For starters, you get a 14” screen that offers a screen to body ratio of 91% which is significantly more than what you’ll find in other laptops. This means you get extremely thin bezels that offers an immersive and breathtaking experience while using this laptop. Not only that, the 13.9” screen has an aspect of 3:2, which is similar to the previously mentioned Microsoft Surface Laptop 2. However, the Matebook X Pro has a resolution of 3000 x 2000 that helps it achieve Pixel Density of 260PPI, which is definitely more than Apple’s Retina Display on MacBook Air and Macbook Pro. Huawei is also smart enough to include Mate Dock 2.0; which increases the laptop’s connectivity to additional USB-A, USB-C, VGA and HDMI ports. It comes with a 57Whr battery that offers excellent battery life of around 8-10 hours on a full charge depending on your usage and screen brightness that clocks about 500 nits. To say the least, if you want a laptop that has the same unibody metal built of MacBook Pro and freedom of Windows 10 in a laptop that is featured packed to the brim, then the Huawei Matebook X Pro is the one that you shouldn’t miss. 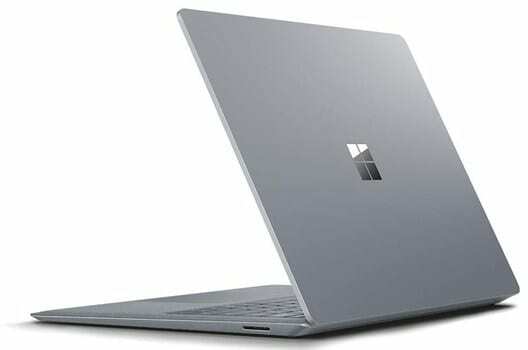 If you want the practicality of a laptop for creating powerpoint presentation and portability of a tablet for multimedia use, then you should definitely take a look at the Microsoft Surface Book 2. Well if you look at the concept of Microsoft Surface Book 2, it isn’t the first laptop with a detachable keyboard. The original Microsoft Surface Pro is based on the same concept of a tablet with a detachable keyboard. However, the Microsoft Surface Book 2 is a more powerful variation of the Microsoft Surface with powerful hardware and bigger screen. 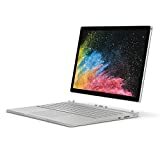 Obviously, there are multiple 2-in-1 laptops with touch screen and foldable design, but the Surface Book 2 concept is very unique in itself because not only can you detach the keyboard but you can also close the tablet; like a laptop’s lid. For starters, carrying the Microsoft Surface tradition, Book 2 comes with a 3:2 aspect ratio screen, which is ideal for making powerpoint presentations with ease. Available in 13” and 15” variation, the one with 13.5” screen comes with a resolution of 3000 x 2000 that result in massive pixel density, slightly larger than previously mentioned Huawei Matebook X Pro. The Microsoft Surface Book 2 is available with Intel Core i5 and Core i7 processors, along with an option for 8GB/16GB RAM and of 256GB, 512GB, and 1TB of SSD storage options. FYI, the entry-level Microsoft Surface Book 2 with 13.5” screen along with Intel i5 processor, 8GB RAM and 256GB SSD costs around $1200, whereas the fully loaded 15” laptop with i7 processor, 16GB RAM, 1TB SSD, and 6GB Nvidia GTX 1060 GPU is just shy of the $3000 mark. On a full charge, the laptop offers the longest battery life of around 12-13 hours compared to other laptops in this list. However, the critical thing to note here is, the tablet has its own battery that offers lower battery life, whereas once connected to the detachable keyboard it draws power from the battery pack in the keyboard module. 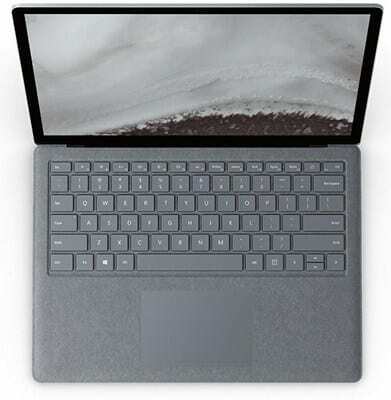 On the connectivity front, the Microsoft Surface Book 2 comes with 1x USB-C port with Thunderbolt support, 2x USB-A port, SD card reader and 3.5mm jack. Additionally, the Book 2 features an 8MP camera on the back and weighs around 3.38 lbs. I hope this article was able to help you choose the Best Laptop for Powerpoint Presentation. If you’re still confused about which laptop to finalize or have any other laptop in your mind that you want to buy, please don’t refrain to let me know in the comment section below. I will try to help you as much as I can. If you loved this article, please do consider sharing this article with your friends on social media sites like Facebook and Twitter.